In 2006 while driving to school with his mother an 11 year old Lawrence Vourtzoumis heard an advertisement on the radio requesting volunteers to shave their heads as a demonstration of solidarity for those who had lost their hair due to chemo treatments for breast cancer. Lawrence, founder of Pink in the City, is a 23 year old cake designer and owner of Patisserie Lawrence V. He has a talent for art and combines this talent with the science of baking to create edible works of art. Lawrence has always felt strongly about fundraising and the importance of giving back. He shares his belief that volunteering makes the world a better place and makes you feel better through his involvement with students in the Model the Way program. He works closely with schools visiting as a guest speaker and has traveled across the continent with a team of 2 speakers to share this vision. He believes that everyone can be a positive agent of change, especially young people. Nicky is a first grade teacher who speaks three languages and also happens to be a makeup artist. Her desire to bring out the best in her students extends to her volunteerism. Being an integral part of the committee Nicky extends her talents and love as a makeup artist to the Pink Carpet event. This eventallows Nicky to bring out the best in cancer survivors by making them feel beautiful inside and out. Nicky feels privileged to be able to volunteer in her community along with her husband, Steven Vourtzoumis and hopes to encourage others to do so. Phil is one of the founding members of Pink in the City. He is in the fifth year of his general surgery residency and plans to be a trauma and acute care surgeon. Apart from his love for operating, Phil is passionate about teaching and leadership and has received multiple awards for his work outside the operating room. When he is not at the hospital, Phil loves spending time with his favorite buddy, his little son, Bobby. Phil is humbled and proud to see how much Pink in the City has accomplished over the years and the ever growing number of volunteers, sponsors and donors who continue to support this important cause. Evie is happily married and the proud mother of a 3 year old son. She is also an elementary school teacher who runs her own Usborne book business called “Evie’s Learning Library”. She is passionate about promoting early literacyand ensuring that all children have access to educational and engaging books. Evie is thrilled to give back to the community by being a committee member for Pink in the City. She particularly enjoys making an impact by being involved in the many and varied events that Pink in the City holds annually. Denise has a long-standing career as a senior manager with FedEx, the world’s largest transportation organization. She is also the mother of three outstanding sons who share her passion for humanitarian and philanthropic causes. Over the last 30 years, Denise has demonstrated her inspiring leadership skills through her work with organizations such as Coaches of Canada, Zonta Club of Montreal and, currently, as a member of the Board of Directors of Hellenic Social Services of Quebec. As President of Pink in the City, she drives impactful and meaningful programs by coordinating and connecting volunteers, partners, and sponsors for the purpose of heightening breast cancer awareness and raising much-needed funding for medical equipment and research. Denise also strives to provide student leadership opportunities within Pink in the City. Kristina holds a bachelor’s degree in Exercise Science from Concordia University and plans to continue her studies at the graduate level. Kristina is an avid volunteer who dedicates time at the Montreal Children’s Hospital as a research assistant where she collects data regarding patient demographics in the Emergency Department. She also welcomes newly admitted patients through the “We Should Talk” program. Kristina is thrilled and grateful to give her time and energy to an important cause through Pink in the City and be part of this outstanding and dedicated team. Amanda is a legal assistant at Davies Ward Phillips & Vineberg. Her active involvement in sports led her to participate in a humanitarian trip to Cameroon in 2012 to help implement an extra-curricular soccer program for youth. Amanda joined Pink in the City in 2015 and particularly appreciates working together with her team members to make a difference. Cancer has affected many people that are dear to Amanda and she strongly believes that the efforts of Pink in the City will help prevent some of these tragedies in the future. Despina graduated from Dawson College where she studied Interior design. She now works for an airline company which allows her to pursue her passion for travel. Despina’s parents instilled the important value of having compassion for others which she in turn imparting on her three amazing children. She is inspired to succeed and do better every day and Pink in the City provides the perfect outlet for her to do so. Working alongside a caring and dedicated team enables her to fulfill her goal of helping others. Despina has great hope for the future and the potential for Pink in the City to make a difference. Anastasia is an account executive at FedEx Canada. Having lost her mother to breast cancer 30 years ago, Anastasia’s 10-year association with Pink in the City is particularly important to her. She is the mother of two amazing daughters, Constantina and Vassiiki, both of whom volunteer for Pink in the City. Together, Anastasia and her daughters make a tremendous contribution to Pink in the City by mobilizing the support of friends and family in the quest to help those afflicted by breast cancer and the search for a cure. “True success only comes when we are of service.” – Anastasia G.
Loredana is a positive and detailed individual. She loves helping anyone in need of a smile. Her creativity and passion for planning events brought Loredana to join the Pink in the City team. Helen has been an educator for 30 years and currently serves as an administrator for the Sir Wilfrid Laurier School Board. Her devotion to her two children led her to become an active volunteer with the Laval Figure Skating Club (CPA) and serve as manager of the Express Laval Hockey Teams. Helen has spent a decade as a dedicated member of the Maids of Athena (AHEPA Organization) and is presently involved with the Hellenic Scholarship Program and the Hellenic Ladies Benevolent Society. 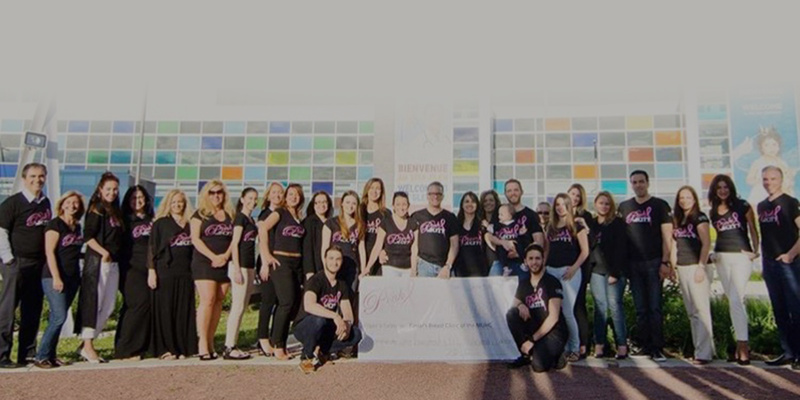 Helen is a committed member of Pink in the City and has been an ardent supporter of the “Model the Way” Program initiated by Pink in the City in Laval high schools. Catherine is currently pursuing a masters’ degree in genetic counselling at the University of Montreal. Catherine’s awareness of breast cancer has made her a constant supporter of this cause. While an undergraduate at Bishop’s University she joined the Bishop’s University Pink Ribbon Society. In her senior year she became president of that charity. Upon her return to Montreal to pursue her graduate studies, Catherine discovered Pink in the City through her association with the Hellenic Scholarship Foundation. She has been honoured to be an active team member of Pink in the City since 2017. Voula is an individual who has been personally touched by breast cancer. A having her family touched by this disease she felt a need to give back. Pink in the City offered her the perfect opportunity to give back to the community. Having once been the one needing and receiving support, she is gratified to reciprocate for others in the same situation. Sandrine worked for a number of years as an administrative assistant in the area of construction before taking on a new challenge by applying her experience and talents to the real estate sector. Having observed the accomplishments of Pink in the City over the past few years, she has decided with great pride to join this dedicated team. “Never say never.” – Charles Dickens. Kiki has worked in finance for the past 20 years. She is the proud mother of three with whom she enjoys spending time. Part of her motivation for volunteering with Pink in the City is that she wishes to be an example to her children of the power of generosity and striving to achieve a greater good. Kiki greatly appreciates her fellow volunteers and the sponsors of Pink in the City. Eleni is a graduating student in the field of law. She has deep roots in her community and has been involved with helping others throughout her elementary, high school and university years. Student led fundraisers and events have been an important focus for her. Eleni has been a member of Pink in the City for the past three years where she has had the privilege of working with a caring and supportive team. Toula is a Laval resident and the mother of three grown children. She is also an active and involved grandmother of three precious grandchildren. Toula is a creative individual who works in the service industry focusing on set up, decor and service. After losing a cousin to breast cancer Toula made a decision to make a difference for those suffering from this disease. Toula joined Pink in the City five years ago and loves meeting others who are involved and the sponsors. She is always touched by their generosity. Anna is a stay at home mother of three delightful babies. She has worked as a hair stylist and greatly enjoys being involved in community service. A supportive husband affords her the opportunity to be a member of Pink in the City where she garners a sense of fulfillment by giving back in every possible way that she can. Maria is a student whose goal is to bring awareness of breast cancer to those of her generation. Since they are the future, she feels that it is imperative that they understand the importance of making a difference. Joining the Pink in the City team has motivated Maria to help the community and has taught her how precious life is. Tina Quintanilla is a marketing professional who is raising three boys with her husband in Laval. She graduated from Concordia University with a degree in marketing and sits of the Board of Directors at Vanier College. Tina is a freelance writer who provides articles about family, parenting and women’s health and wellness for Laval Families Magazine. She is the founder of Mon-Brand, a Canadian marketing and corporate event planning firm based in Montreal. Revitalize 2018and Mastermind Networking are Tina’s initiatives. Tina is honored to support Pink in the City through fundraising and event planning. Frances works for a multi-national accounting firm as a client service coordinator. In her role, she works with people from around the world and leads teams from Canada and India. Frances has two teenage sons with whom she enjoys spending time along with her husband, friends and other family members. As a breast cancer survivor since 2010, Frances has made it her mission to raise awareness about the importance of self-examination and early detection. She has participated in the Weekend Walk to End Women’s Cancers for four consecutive years and has joined the Pink in the City team as an additional way of giving back. Daniel has a background in youth leadership development through his work with community and educational organizations in Alberta and Quebec. He presently works as a behaviour specialist at the Sir Wilfrid Laurier School Board, where he oversees the “Model the Way” program. Under his stewardship, students have recorded over 150,000 volunteer hours in the past five years through this program, many of which have been in support of Pink in the City. “Pink in the City is not just about fundraising, it is about teamwork, science, understanding, compassion and action.” – Daniel S.
Evangelia is a partner at Levy Tsotsis Attorneys where she specializes in civil and commercial litigation and family law. She has been a member of the Levy Tsotsis team since 2006. A graduate of Concordia University and the University of Ottawa, she has been a guest lecturer at Osgoode Hall Law School and York University. Evangelia is a member of the Board of Trade of Metropolitan Montreal, the Association of lawyers in family law in Quebec and the Hellenic Board of Trade, which honoured her with the Business Woman of the Year Award in 2016.Evangelia speaks three languages and is pleased and enthusiastic to share her many talents with Pink in the City. Taylor graduated from Concordia University’s Journalism Program in 2017. She specializes in broadcast journalism with a background in radio and print. Taylor has worked at CBC News Montreal in the radio division where she did scriptwriting, reporting on current events and presenting on Homerun. She also interned at CTV News, TSN 690 and MAtv. In her spare time Taylor enjoys scouting out interesting places to eat in Montreal. Gaelle was born in France to a mother who was a photographer. At an early age she developed a love for all aspects of photography. Gaelle specializes in portrait photography where she strives to expose the internal as well as external beauty of her clients. Her objective is for each person she photographs to have an unforgettable experience. Gaelle volunteers her talents and services to Pink in the City by showcasing their events and projects in photos. Most importantly, Gaelle envisioned and created The Pink Carpet event which celebrates and honors breast cancer survivors. When Pink in the City began with a young Lawrence Vourtzoumis shaving his head the goal was twofold; to raise funds to donate to breast cancer and to demonstrate that even one little boy could make a difference. Now students in many schools are involved with our cause. In the spring of 2017, we wanted to celebrate the strength and courage of breast cancer survivors so we invited 8 women to be primped and pampered, and to walk down the carpet of our first Pink Carpet event.